The bike route on the Scottsdale Greenbelt has a number of start and end points. Where you begin your bike ride on the Greenbelt should depend on what you want to see and how long you want to ride. You can start your ride at the north end of the Greenbelt on Shea Boulevard and 92nd Street, at the south end at Tempe Beach Park near the Tempe Center for the Arts, or at one of the many parks along the route such as Mountain View Park, Chaparral Park, Indian School Park, El Dorado Park, among others. For a better look at the route, check out Scottsdale’s interactive map! The Indian Bend Wash cuts through Scottsdale’s urban center and creates a beautiful path full of desert vegetation and greenery on either side. This natural wash was the subject of a world-renown flood control project that serves both the cities of Scottsdale and Tempe by managing rainwater and creating a recreation zone that has become an important part of the community. 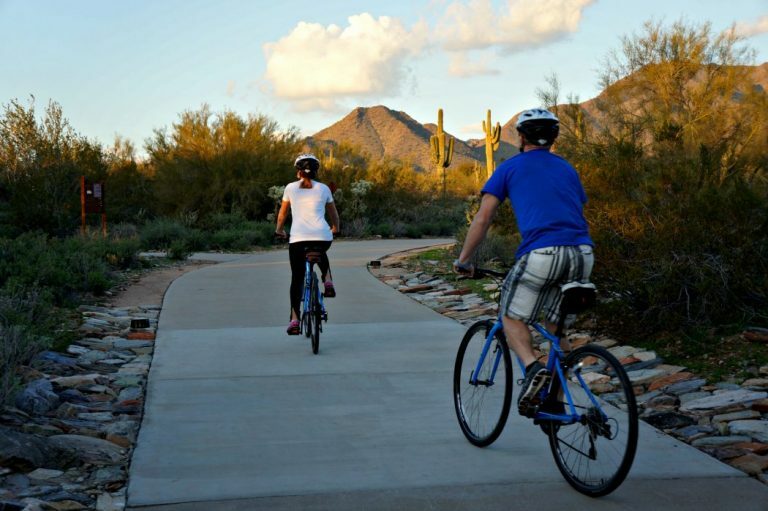 The Scottsdale Greenbelt route is made up of wide paved paths that are mostly flat with a gentle downward slope when riding the Greenbelt north to south. The route also offers multiple bridges and tunnels to avoid crossing major traffic, making it perfect for a leisurely cruise for a bike rider of any ability level and safe ride for the kids, too! Stop for beers, burgers, ice cream, or bring a picnic– your choice! The access to bars, restaurants and cafes may be one of the greatest reasons to ride your bike on the Scottsdale Greenbelt. If you’re beginning in Scottsdale at the north end of the Greenbelt, there are plenty of restaurant options at the McCormick Ranch Center off Shea Boulevard, some of our favorites are Flower Child and nearby Scottsdale Beer Company. At the end of your ride, quench your thirst with a cold beer at one of the breweries on Mill Avenue (Blasted Barley Beer Co., Pedal Haus Brewery, nearby at Four Peaks Brewery, or The Shop Beer Co.) or stop for some fresh healthy eats at Farm and Craft Scottsdale. If you’re starting your ride in Tempe, eat first at one of Mill Avenue’s many restaurants then burn off lunch along the way so you can finish with a sweet treat at Sweet Republic on Shea Boulevard and 92nd Street, which serves up some of the best made-from-scratch ice cream in town. For a picnic along the Scottsdale Greenbelt, stop at either Indian School Park or Chaparral Park. You can use just about any bike to ride on the paved Greenbelt path at Scottsdale’s Indian Bend Wash whether you have a road bike, a mountain bike, or just a casual cruiser. If a day of biking along Scottsdale’s Indian Bend Wash Greenbelt sounds like fun to you but you don’t have a bike of your own, check out our casual bike rentals! Join a Bike Tour Instead!